representatives of Thailand, Indonesia and Malaysia, have convened a joint meeting in Bangkok to discuss many issues including the sixth initiative on export volume restrictions. 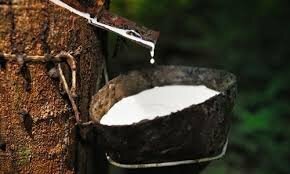 The three countries will jointly limit the level of rubber exports to 240,000 tons in total. A horticulture specialists and other rubber farmer growers to view each farm on (ALL) its merits , evaluate and then terminate those that don't meet the grade set, but help those that do not meet the grade to change. Let's see if these three can manipulate world market prices. In the short term of mass over supply, less exports mean lower prices. Will this strategy really improve prices over time because of their actions? Of course these three trustworthy countries will abide by all restrictions. Recycling old policies, the recent ITRC agreement to limit current level of rubber exports to 240,000 tons is unlikely to significantly improve global prices. Stimulating purchasers might work better than three exporters keeping their prices up / export volumes down to the benefit of other non-member exporters, while creating an oversupply, possibly subsidized, on the internal market. Are there no smart applications for Rubber ? Lightweight firmness auto-adjusting mattress ? or next generation temperature and road condition adjusting tires ? The 3 countries produces a total of roughly 9 million tonnes of raw rubber but will now limit exports to only 240,000 tonnes in total. Highly unlikely. Unless they meant 240,000 each. Just reread the article.."under﻿﻿ the rules and regulations of each country for four months starting from April 1, 2019." So it's 240,000 tonnes every 4 months.